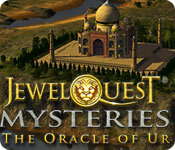 Jewel Quest Mysteries: The Oracle of Ur is rated 2.4 out of 5 by 77. Rated 5 out of 5 by gratefuldebbie from Great Mix of HOG and MATCH 3 I really enjoyed the combination of hidden object game play and match 3. I didn't find the graphics "gritty" or "grainy" as some game players stated. On my computer, it was very clear. I wasn't bothered at all by the occasional hint or tutorial. And I certainly didn't find the coins hard to find. I am a big fan of Jewel Quest Mysteries and this did not disappoint. I loved the game. I was not bored at all and would have loved to continue playing but the Free Trial is only 60 minutes. If you are a fan of the Jewel Quest series, you must try this one. And don't be discouraged by some of the reviews on this site. I give this game 5 stars in every category. Rated 5 out of 5 by sunfiregirl from Jewel Quest Mysteries The Oracle of Ur I love the Jewel Quest Mysteries, very relaxing, challenging enough for us older HOG fans. I play the games for enjoyment and sometimes the deep dark games are not for me. Give me the Jewel Quest, Mystery PI and many of the older games anytime. Rated 5 out of 5 by patbeil from Love it I loved the first Jewel Quest Mystery game. And, I love this one too. I played the first game for months, hopefully I'll do the same with this one. Rated 5 out of 5 by biscut19144 from working through conflct awsome I love the jewel quest series..I love the time challenge great!!! Rated 5 out of 5 by Sante001 from A Different Kind of Jewel Quest . . . I love It! Yes, this game is different from the others. If you looking for the usual match-3 (only), or hidden objects (only), this is not the game for you ... but ... if you're looking for a different kind of game that combines the two . . . please give this game a try. My Likes -- There is a good storyline going on in this game. And the dialogue (not to much to turn you off) guides you nicely through the game. The hidden object scenes have different objectives. In some, you have to find objects before you can go to the next level/step. For example, you have to find pieces of a pulley to start the process of finding the puzzle pieces. 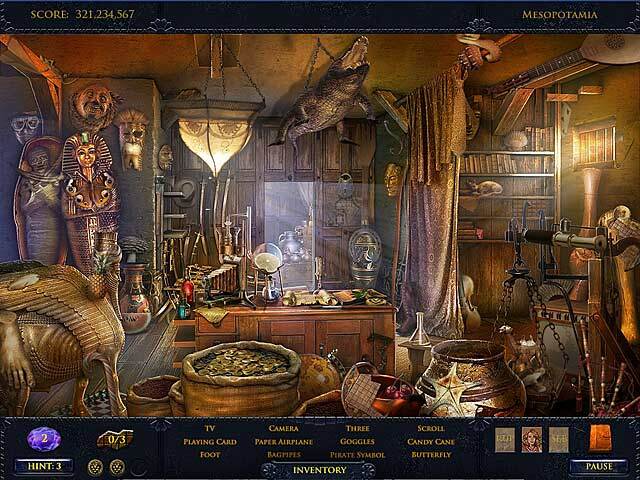 After finding the puzzles pieces, you then have access to a room, where you have a hidden object scene. In these scenes, you can find extra coins or jewels to earn extra hints. There is a lot going on and you have to use your grey matter to keep up with things. I also like the fact that the match-3 games are mixed throughout. And yes, before you can play them, you have to find all the pieces to play it. I'm Surprised . . . that some many reviewers found this game boring. There is nothing boring about this game. 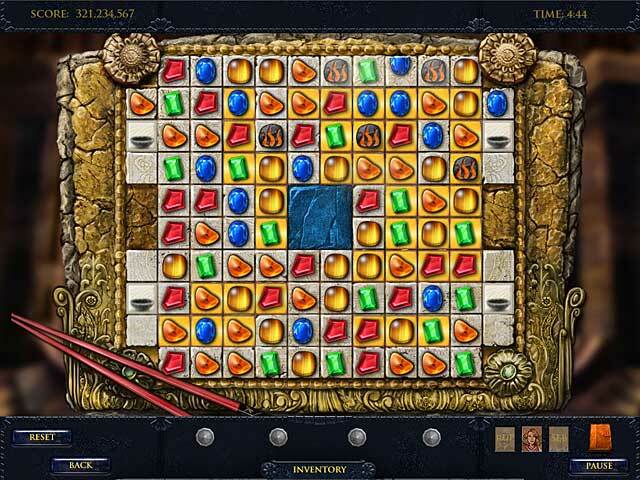 Unless you find playing hidden object scenes and match-3 boring. My Didn't like so much . . . I don't remember being given the option to play relaxed or timed. I would have preferred to have had that option. I like playing against the clock. For some game players, the dialogue might be a "bit much." I was OK with it Recommendation .... I plan to purchase this game. I played the full 60 minutes and wanted to keep going. As always, I recommend that you give this game a try. I loved it! Rated 4 out of 5 by Copperfield from Jewel Quest game scores again I love the Jewel Quest games and this was not a disappointment. It seems we're back at the beginning because Emma is consistently choosing the wrong guy but.... There is a nice balance of HO and board games. I found one of the additional games challenging - trying to get the water to stop so that the big rock would drop. And the hints were no good. But that's what I like about JQ - they're never boring. I finally figured it out - spoiler alert - keep putting the pipes in different places until Eureka! Rated 4 out of 5 by dollyflower from A Very Challenging Game I have played the other games in this series that are like this one, a mix of Match 3 and HOS. I enjoyed each one of them. I don't particularly like Match 3, but the HOS are challenging. 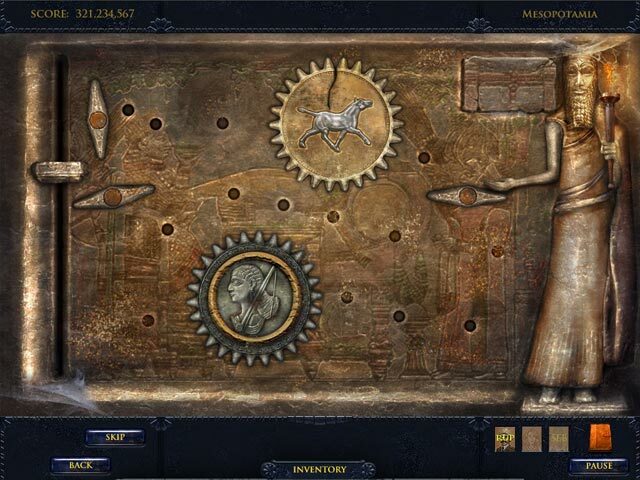 In this game the coins collected for hints hold over from scene to scene and the hint meter fills up if you have used them all. The story is interesting, but not essential to my enjoyment. Check back on some of the other games in the series. They are not all a combination as this one is. I bought it as a weekly deal, because I had enjoyed the others. Preview it first to see if it is for you. Rated 4 out of 5 by Saunnylu from Big Tiny Problems "The Oracle of Ur" appears to be a very fun and interesting game to play. Very nice sound. Graphics and artwork appear to be very clear and sharp--Beautiful--if only it were larger. However, both the screen size and the font size are too tiny! This player needs to be Within 1 foot of distance toward the screen 1--to find hidden objects, and 2--to read any/all written word. The font size appears to be comparable with a size 6-8 font. Enlarge the screen and use a font comparable with size 12-14, I look forward to playing this game to the end when the above problems are repaired. Thank you for your attention to these concerns. Rated 4 out of 5 by nelliebj from Yay, a new Jewel Quest! I saw that the game wasn't popular but I decided to try it anyway. No regrets! I have all the Jewel Quest games. And I got this one too but only after I tried the one hour demo. The hour went by very quickly and I was still enjoying it so I went ahead and bought it. It's not easy. If you expect a game that doesn't challenge you, don't get this. But that's part of what I like about it. The HOG part is really great...no the items are not that easy to find (they are very well hidden) but you can. And, since that part of it is not timed, take the time to find the items. There are scenes where you need to find tools for your inventory. Again, keep looking...they are there and they do light up when your cursor passes over them. The jewel boards are timed. But, you can "buy" extra time with your jewels. You find jewels in each scene and you find coins. Both are useful when you need them. All I can say is...persevere! This is a great game, you just have to work a little harder. Yes, I bought it. Because I like the challenge and like all the Jewel Quest games, it's worth it. Help Rupert and his friends retrieve the Oracle of Ur?